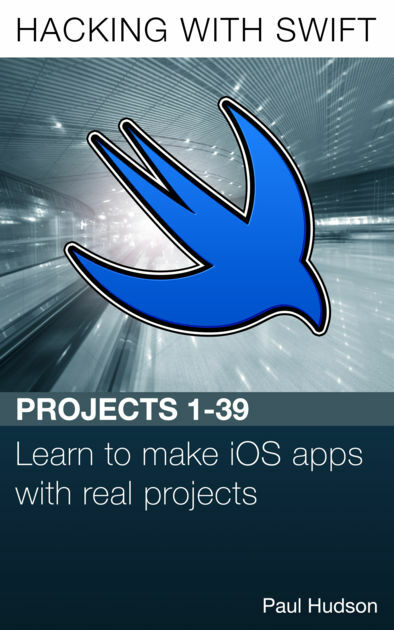 The Hacking with Swift tutorial series is designed to make it easy for beginners to get started coding for iPad and iPhone using the Swift programming language. My teaching method skips out a lot of theory. It skips out the smart techniques that transform 20 lines of easy-to-understand code into 1 line of near-magic. It ignores coding conventions by the dozen. And perhaps later on, once you've finished, you'll want to go back and learn all the theory I so blithely walked past. But let me tell you this: the problem with learning theory by itself is that your brain doesn't really have any interest in remembering stuff just for the sake of it. You see, here you'll be learning to code on a Need To Know basis. Nearly everything you learn from me will have a direct, practical application to something we're working on. That way, your brain can see exactly why a certain technique is helpful and you can start using it straight away. This book has been written on the back of my personal motto: "Programming is an art. Don't spend all your time sharpening your pencil when you should be drawing." We'll be doing some "sharpening" but a heck of a lot more "drawing" – if that doesn't suit your way of learning, you should exit now. Follow the series: The tutorials are designed to be used in order, starting at the beginning and working through to the end. The reason for this is that concepts are introduced sequentially on a need-to-know basis – you only learn about something when you really have to in order to make the project work. Don't skip the games and techniques: The tutorials follow a sequence: app, game, technique, app, game, technique, etc. That is, you develop an app, then you develop a game, then we focus on a particular iOS component together to help make your apps better. The apps and games are, of course, standalone projects that you can go on to develop as you wish, whereas the technique tutorials will often be used to improve or prepare you for other projects. Swift needs. It's called "Hacking with Swift" because the goal of each project is to reach the end with as little complication as possible – we're hacking, or playing around, with the language, not trying to give you Comp Sci 101. I can't re-iterate that last point enough. What I have found time and time again is that any tutorial, no matter how carefully written or what audience it's aimed at, will fail to fit the needs of many possible readers. And these people get angry, saying how the tutorial is wrong, how the tutorial is lame, how their tutorial would be much better if only they had the time to write it, and so on. Over the last 12 years of writing, I have learned to ignore minority whinging and move on, because what matters is that this tutorial is useful to you. You'd be surprised by how many people think the path to success is through reading books, attending classes or, well, doing pretty much anything except sitting down in front of a computer and typing. Not me. I believe the best way to learn something is to try to do it yourself and see how it goes. Sure, going to classes might re-enforce what you've learned, or it might teach you some time- saving techniques, but ultimately I've met too many people with computing degrees who stumble when asked to write simple programs. Don't believe me? Try doing a Google search for "fizz buzz test", and you'll be surprised too. So, dive in, make things, and please, please, please have fun – because if you're not enjoying yourself, Swift coding probably isn't for you. To download the files for any Hacking with Swift project, or if you'd like to learn more about the series, visit the series website and see the full range: hackingwithswift.com. If you spot any errors in this book, either typos or technical mistakes, please do let me know so I can correct them as soon as possible. The best way to get in touch is on Twitter @twostraws, but you can also email paul@hackingwithswift.com.